Christopher was born with music in his bones. At the wee age of 5 he built a makeshift podium so he could pretend to conduct to Tchaikovsky. At 6 he was making guitars out of yardsticks, rubber bands, shoeboxes, and twine. 40 years later, through The Ramones, Kiss, and Hendrix, to jazz, blues, and other areas of rock, and a BA in Music with emphasis in Applied Guitar, Christopher is still at it, composing music and teaching. His encyclopedic knowledge of music and the guitar makes him an essential guide and mentor on the Guitar Tricks forum and as a teacher in our tutorials! This single lesson tutorial provides a simple reference for reading music notation. This chart shows you rhythm symbols, the time duration, and how to count them. This tutorial series will introduce the beginner guitarist to the concept of systematically practicing scales using a metronome. The C major and minor scales will be used. Four patterns will be used as examples of a systematic practice method: up and down, in 3's, in 4's, and pedal point. Use of the metronome is stressed as crucial for proper practice and development. While this tutorial is primarily written for beginners, experienced players might benefit from this detailed method of how to practice scales. This beginners series explores the basics of the C minor scale. This tutorial shows how to do basic scale exercises with the C Minor Scale. This tutorial is primarily written for beginners. But even experienced players might benefit from this quick, concise review of how to "practice scales". In this tutorial we will look at visualizing the major scale in the three main patterns it forms on the guitar fretboard. We will use the A major scale as an example. In this tutorial we will look at visualizing the minor scale in the three main patterns it forms on the guitar fretboard. We will use the A minor scale as an example. Christopher will show you how the major scale is harmonized by building the notes of the scale into chords and their relative functions. Christopher will show you how the minor scale is harmonized by building the notes of the scale into chords and their relative functions. In this tutorial we will learn how the minor scale can be altered to make different scales, chords and harmonies. We'll build a minor chord progression and learn how to play the natural diatonic minor scale as melodic lines along with those chords. Then we'll alter the chords and scales to show the different possible minor sounding flavors that are used in music. By the end of this tutorial you should be able to understand the basic idea of the Circle of Fifths and how it is used in actual music. Christopher will show you basic ear training exercises designed to be used for guitarists. You will use the guitar to play, hear, sing and identify all 12 chromatic scale degrees. We'll start with the diatonic major and minor scales. Then we'll add the remaining chromatic degrees. Then we'll try some basic exercises to practice identifying all those intervals in order to gain the aural skill of relative pitch identification. Christopher will show you basic ear training exercises designed to be used for guitarists. You will use the guitar to play, hear, and identify major chords and minor chords. We'll also learn to identify chord progressions by listening for their bass motion and using functional harmony Roman Numerals. Then we'll try some basic exercises to practice identifying those chord qualities and chord progressions in order to gain those aural skills. This tutorial series is about creating and playing two part harmony guitar lines in rock style music. This is often one guitar part playing a melody, lead or solo part that is harmonized by a second guitar. Major scale harmony will be used to explore the basic types of contrapuntal motion. This tutorial is part two in a series is about creating and playing two part harmony guitar lines in rock style music. This is often one guitar part playing a melody, lead or solo part that is harmonized by a second guitar. Major scale harmony will be used to explore the basic types of contrapuntal motion: similar, oblique and contrary. This is the third tutorial about creating and playing two part harmony guitar lines in rock style music. This is often one guitar part playing a melody, lead or solo part that is harmonized by a second guitar. Minor scale harmony will be used to explore the basic types of contrapuntal motion: similar, oblique and contrary. This tutorial explains how scales and chords are related to each other. You will also learn musical examples that show how to combine scales and chords. This tutorial shows you an exercise on how the A major scale can be used to "walk in and out" of a group of related major chords (A, D, E major). This tutorial shows you an exercise on how the A minor scale can be used to "walk in and out" of a group of related minor chords (A, D, E minor). This tutorial introduces the beginning guitar player to the full (non-simplified) versions of the A, D and E minor chords in open position. These are the standard basic chords that form the basis for thousands of songs. This tutorial introduces the beginning guitar player to the full (non-simplified) versions of the B, C, F and G minor chords. These are standard basic chords that form the basis for thousands of songs. In this tutorial series we will use a backing track to practice the chords A major, D major, and E major. We are going to focus on two things: getting from one chord shape to the next and doing it in time with the music. In this tutorial series we will use a backing track to practice the chords A minor, D minor, and E minor. We are going to focus on two things: getting from one chord shape to the next and doing it in time with the music. In this tutorial series we will use a backing track to practice the chords C major, F major, and G major. We are going to focus on two things: getting from one chord shape to the next and doing it in time with the music. In this tutorial series we will use a backing track to practice the chords C minor, F minor, and G minor. We are going to focus on two things: getting from one chord shape to the next and doing it in time with the music. In this tutorial series we will use a backing track to practice the chords E major, A major, and B major. We are going to focus on two things: getting from one chord shape to the next and doing it in time with the music. In this tutorial series we will use a backing track to practice the chords E minor, A minor, and B minor. We are going to focus on two things: getting from one chord shape to the next and doing it in time with the music. This tutorial teaches you how to play a beginner arrangement of "House of the Rising Sun". There are only five open position chords you need to know to play the song. First I will introduce you to the song, then I'll show you how to play a simple strumming version. Next I'll show you how to pick through the notes in the chords, or "arpeggiate". Finally, we'll play through the song with a backing track using arpeggiation. Playing chords is the first step in guitar playing. Switching between chords is the first great leap in guitar skill. If you can switch between chords, you can play a song. This tutorial for the beginning student introduces changing minor chords at a very slow pace. Playing chords is the first step in guitar playing. Switching between chords is the first great leap in guitar skill. If you can switch between chords, you can play a song. This tutorial teaches the beginning student how to switch between G, E minor, C and D chords in time with a backing track. Playing chords is the first step in guitar playing. Switching between chords is the first great leap in guitar skill. If you can switch between chords, you can play a song. This tutorial teaches the beginning student how to switch between C, A minor, F and G chords in time with a backing track. Playing chords is the first step in guitar playing. Switching between chords is the first great leap in guitar skill. If you can switch between chords, you can play a song. This tutorial teaches the beginning student how to switch between A minor, C, D minor and E chords in time with a backing track. This tutorial explains the concept (theory) of barre chords and how to apply them (practice) to the guitar. We will start with the mechanics of how to "barre" and then learn how to use our barring index finger as a sort of "movable capo". Using this idea enables us to use the basic open chords of E major, E minor, A major and A minor to play any given major or minor chord chromatically in many different positions covering the fretboard. This tutorial provides a way of systematically practicing all the basic barre chord shapes. This tutorial assumes you know the four basic shapes: E major, E minor, A major, and A minor. Once you know and can play those four shaped barre chords in any fretboard position (rooted on any given fret) it is time to learn to move them around the fretboard. It is time to practicing switching back and forth between them in order to practice using them as you would when playing them in a piece of music. This tutorial is an introduction to dominant 7th chords mostly in open position. This tutorial assumes you already know all the basic open position major chords A through G. It also helps to have an understanding of basic barre chords. By the end of this tutorial you should know all the basic open position dominant 7th chords. This tutorial is an introduction to barred dominant 7th chords. This tutorial assumes you already know all the basic open position major chords and dominant chords A through G. It also assumes you understand and can play basic barre chords. By the end of this tutorial you should know how to use basic E and A barre chord shapes to play dominant 7th chords. We will also include the D7 shape. This tutorial is an introduction to major & minor 7th chords. This tutorial assumes you already know & can play basic barre chords & barred, moveable dominant 7th chords. By the end of this tutorial you should know & be able to play major & minor 7th chord shapes rooted on the E, A and D strings. In this tutorial we will use major 7th & minor 7th chords shapes in practicing. The goal here is to play & switch between these chords in time with a backing track. This tutorial assumes you already understand and can play the chord shapes. By the end of this tutorial you should be able to play E, A and D string rooted major 7th & minor 7th chord shapes along with a backing track. In this tutorial we will use some of the barred & moveable dominant 7th chord shapes in practicing. The goal here is to play & switch between these chords in time with a backing track. This tutorial assumes you already understand and can play basic barre chords. By the end of this tutorial you should be able to play E, A and D moveable barre chord shapes along with a backing track. Chord Inversions are a very powerful musical tool. They can "open up" the entire fretboard for your use & thereby make your music much more expressive. This tutorial will explain to you how chord inversions work. By the end of this tutorial you should understand and be able to play basic triad chord shapes and their inversions in multiple fretboard locations. You should understand how chords are built from scales and the concept of triadic harmony or tertiary harmony. In this tutorial we will use a backing track to systematically practice triad chords and their various inversion shapes on the E, A and D strings. Among the goals of this tutorial are integrate the theory of chord voicings and voicing motion with practicing and visualizing the specific shapes of triad chord inversions. In this tutorial we will use a backing track to systematically practice triad chords and their various inversion shapes on the A, D and G strings. Among the goals of this tutorial are integrate the theory of chord voicings and voicing motion with practicing and visualizing the specific shapes of triad chord inversions. In this tutorial we will use a backing track to systematically practice triad chords and their various inversion shapes on the D, G and B strings. Among the goals of this tutorial are integrate the theory of chord voicings and voicing motion with practicing and visualizing the specific shapes of triad chord inversions. In this tutorial we will use a backing track to systematically practice triad chords and their various inversion shapes on the G, B and E strings. Among the goals of this tutorial are integrate the theory of chord voicings and voicing motion with practicing and visualizing the specific shapes of triad chord inversions. In this tutorial we will use a backing track to systematically practice minor triad chords and their various inversion shapes on the E, A and D strings. Among the goals of this tutorial are integrate the theory of chord voicings and voicing motion with practicing and visualizing the specific shapes of triad chord inversions. In this tutorial we will use a backing track to systematically practice minor triads and their various inversion shapes on the A, D, & G strings. Among the goals of this tutorial are integrate the theory of chord voicings and voicing motion with practicing and visualizing the specific shapes of triad chord inversions. In this tutorial we will use a backing track to systematically practice minor triad chords and their various inversion shapes on the D, G & B strings. Among the goals of this tutorial are integrate the theory of chord voicings and voicing motion with practicing and visualizing the specific shapes of triad chord inversions. In this tutorial we will use a backing track to systematically practice minor triads and their various inversion shapes on the G, B & E strings. Among the goals of this tutorial are integrate the theory of chord voicings and voicing motion with practicing and visualizing the specific shapes of triad chord inversions. In this tutorial we will look at a way of visualizing the guitar fretboard. First we will look at playing diatonic scales (major, minor and the various diatonic modes) in patterns that result in 3 notes per string. By doing this the result is that there are only 3 different shapes to learn. That is to say, every diatonic scale can be played by using combinations of only these three basic fingerings. In this tutorial we will look at a way of visualizing major scale fretboard patterns and intervals on the guitar. We will use the E major scale on sets of two adjacent strings. We will visualize the E major scale in patterns that result in 3 notes per string on 2 adjacent strings. We will do this in three octaves (lower, middle and higher) that cover the entire range of the guitar. In this tutorial we will look at a way of visualizing minor scale fretboard patterns and intervals on the guitar. We will use the E minor scale on sets of two adjacent strings. We will visualize the E minor scale in patterns that result in 3 notes per string on 2 adjacent strings. We will do this in three octaves (lower, middle and higher) that cover the entire range of the guitar. In this tutorial we will visualize the chromatic scale in multiple positions in order to see any given chromatic interval as a possible scale degree or chord tone. In this tutorial series we will discuss pentatonic scales, patterns & shapes. We will use them to build pentatonic "frameworks" (or "box shapes") as a visual aid to see familiar patterns on the fretboard. And then use them as a springboard to understanding scale degrees and why scales sound the way they do. In this tutorial we will learn a lick that incorporates all 5 fretboard shapes/positions that form the pentatonic minor scale. The idea is to play a simple repeating pattern of six notes on the top two strings (E and B strings). We use the first pentatonic position and this results in a pattern that has two notes on each string, both three frets apart. Then, we build the same type of pattern and lick, but using the second pentatonic position. We continue on to the third, fourth, fifth and finally first position again one octave higher. In this tutorial we will learn another lick that incorporates all 5 fretboard shapes/positions that form the pentatonic minor scale. The idea is to play a simple repeating pattern of five notes on two adjacent strings, then move the pattern up an octave, and again another octave. Using this little pattern of five notes we can wind our way up through each pentatonic box after another until we cover the entire fretboard. In this tutorial we will learn another lick that incorporates all 5 fretboard shapes/positions that form the pentatonic minor scale. The idea is to play a simple 4 note lick that is very widely used in many rock solos (and other genres). The lick involves a hammer-on and a pull-off. Using this little pattern of four notes we can wind our way up through each pentatonic box after another until we cover the entire fretboard. In this tutorial we will learn to connect the 5 pentatonic box patterns using tapping technique. This is another tutorial in the overall series of connecting pentatonic boxes in rock style guitar. In this set of lessons we'll learn some essentials in the style of legendary rock guitarist Ritchie Blackmore, starting with a look at his tone. We'll then lay out finger-plucked riffs, blues licks, and minor triad sweeping followed by a play along. Next up is octave riffing, scale sequencing, and 2-string arpeggio pull-offs and a play along; then we'll look at "snake charmer" riffs and licks and phrygian triads, and another play along! This tutorial covers controls and usage of solid state amplifiers. In this tutorial we will learn the basics of syncopated rock rhythm guitar playing patterns. We'll start with a few simple open major chords and learn to apply a technique that alternates palm muted bass notes on the strong beats and punchy chords on higher strings on the backbeats. In this tutorial we will learn the basics of syncopated rock rhythm guitar playing patterns. This time, we'll use a few simple open minor chords and learn to apply a technique that alternates palm muted bass notes on the strong beats and punchy chords on higher strings on the backbeats. In this tutorial we will learn more about playing syncopated rock rhythm guitar patterns. This time we'll use open chords but add more notes to our rhythmic pattern that alternates between palm muted bass notes and punchy chords on higher strings. In this tutorial we will learn more about playing syncopated rock rhythm guitar patterns. This time we'll use barre chords to play our more addvanced syncopated pattern that alternates between palm muted bass notes and punchy chords on higher strings. In this tutorial, we'll learn some rock whammy (or "vibrato") bar techniques. I'll start by looking at some basic techniques and licks, then talk about how the whammy bar works and some insights into tuning issues. Then I'll teach you a rock riff with whammy, some "divebombing", and some ornamental dips. Next up are a few lessons using hammer-ons and pull-offs, followed by "harmonic dipping and screaming". We'll end with a play along. In this tutorial we will learn some rocking riffs in the style of 1970s arena rock bands. I grew up in the 1970's listening to and learning the music of Deep Purple, Montrose, Kiss, Van Halen, ACDC. These bands were well known for their powerful, energetic, melodic take on rock music. They played, sounded (and often performed) in a way that was larger than life! Christopher will introduce the concepts needed for the beginner to understand and learn how to improvise a single note melody, lead or solo over a major key chord progression. This includes key signature as the scale that relates all chords in a progression, rhythmically targeting chord tones, building melodies and musical phrases from the scale and chord tones as a basis for improvising over the chord progression. Christopher will show you the concepts required to improvise. You will learn how to improvise a single note melody, lead or solo over a major key chord progression. This includes finding the key signature as the scale that relates all chords in a progression, rhythmically targeting chord tones, building melodies and musical phrases from the scale and chord tones as a basis for improvising over the chord progression. You will also gets a lot of practice applying those concepts. Christopher will show you the concepts required to improvise. You will learn how to improvise a single note melody, lead or solo over a minor key chord progression. This includes finding the key signature as the scale that relates all chords in a progression, rhythmically targeting chord tones, building melodies and musical phrases from the scale and chord tones as a basis for improvising over the chord progression. You will also gets a lot of practice applying those concepts. Christopher will show you more ideas on how to improvise. You will learn how to improvise a single note melody, lead or solo over a major key chord progression. In this tutorial we'll learn more about finding the key signature, rhythmically targeting chord tones and building melodies and musical phrases. We'll also practice alternating between playing the chord progression and the lead melody. Christopher will show you more ideas on how to improvise. You will learn how to improvise a single note melody, lead or solo over a minor key chord progression. In this tutorial we'll learn more about finding the key signature, rhythmically targeting chord tones and building melodies and musical phrases. We'll also practice alternating between playing the chord progression and the lead melody. In this tutorial we will learn how to play the A major scale using a 3-note per string pattern that will cover all six strings. In this way we can move across the entire fretboard and explore the modes of the major scale. We will eventually do this with all seven modes. In this way we can link all the mode patterns together and cover the entire fretboard vertically and horizontally with these interlocking patterns. In this tutorial we will practice the modes of the major scale and learn to see and hear them as individual entities in a variety of fretboard patterns. We will learn that each mode has it's own unique, characteristic sound and function. In this tutorial series of lessons we will look at a further method of building speed. We will use the E major scale on two adjacent strings covering a complete octave in three note per string groupings. In this tutorial series of lessons we will look at a further method of building speed. We will use the E minor scale on two adjacent strings covering a complete octave in three note per string groupings. In this tutorial we will look at a further methods of building speed in a minor key. We will also apply these advanced skills to playing licks over a backing track. Among the techniques covered are: harmonic minor scale use, phrygian dominant mode use, fast scalar sequence passages, fast minor and diminished arpeggios, pedal point. In this tutorial we will look at a further methods of building speed in a major key. We will also apply these advanced skills to playing licks over a backing track. Among the techniques covered are: major scale use, mixolydian mode use, fast scalar sequence passages, fast major arpeggios, pedal point. By the end of this tutorial, you understand the basics of sweep picking technique and be able to play a simple 3 note triad chord sweep in major and minor chords and keys. In this tutorial we will expand the basic 3 note triad chord sweep picking technique into a 4 note chord sweep in major and minor chords and keys. By the end of this tutorial, you understand how to apply sweep picking technique to a simple chord progression in a variety of ways using major and minor chord tones and scale notes. By the end of this tutorial, you understand more about how to apply sweep picking technique to a simple chord progression in a variety of ways using major and minor chord tones and scale notes. 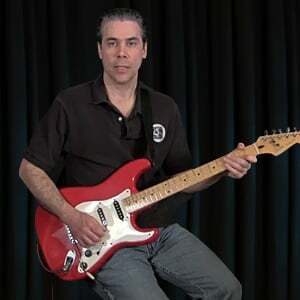 By the end of this tutorial, you understand advanced sweeping applications and shred arpeggios using major and minor chord tones and scale notes. In these five lessons in this final tutorial on sweep picking, I'll be teaching you some more advanced applications of this technique. First I'll show you a shred sweep lick over an A minor based progression, then we'll look at an E harmonic minor arpeggio pattern. I'll follow that up with using diminished arpeggio sweeps, and using shred sweeps in a "bluesy" way. I'll finish with playing sweeps over a long descending chord progression. Christopher will show you all the rocking electric guitar parts to this arrangement of a holiday classic. From the quiet intro volume swells, to the harmonized melody lines to the soaring solos! In this tutorial we will learn a rock style arrangement of Pachelbel's "Canon In D". Because this piece was originally in Baroque style, it was written for a string group (violins, violas, cellos). But, we are going to learn it in a rock guitar style. So, we'll call it "Baroque and Roll"! In this tutorial we will learn a rock style arrangement of the main theme from Rossini's "William Tell Overture". This tutorial is about extended harmony chords. This covers more types of 7th chords beyond dominant 7ths, major 7ths and minor 7ths. This tutorial assumes you already know & can play those more basic 7th chord forms & shapes. We will extend the concept of triadic harmony to include: diminished 7ths, dominant 7th/flat 5th, minor 7th/flat5th, and minor/major 7th chords. We will learn how to play these as chord shapes rooted on the E, A and D strings. Then we will play them in a jazzy chord progression with a backing track. This tutorial is about extended harmony chords. We will learn types of 9th chords. This tutorial assumes you already know & can play those more basic 7th chord forms & shapes. It also assumes you have worked through Extended Harmony Chords Series 1. We will extend the concept of triadic harmony to include the 7th and the 9th of: 6/9ths, minor 9th, dominant 9th, dominant 7th flat 9th, dominant 7th flat sharp 9th (also called dominant 7th flat augmented 9th). We will learn how to play these as chord shapes rooted on the E, A and D strings. Then we will play them in a jazzy chord progression with a backing track. This tutorial is about extended harmony chords. This covers types of 11th and 13th chords. This tutorial assumes you already know & can play 7th and 9th chord forms & shapes. It also assumes you have worked through Extended Harmony Chords Series 1 and 2. We will extend the concept of triadic harmony to include the 7th, 9th, 11th and 13th of: dominant 11th, minor 11th, dominant 13th, dominant flat 13th. We will learn how to play these as chord shapes rooted on the E, A and D strings. Then we will play them in a jazzy chord progression with a backing track. In this introduction to jazz style rhythm guitar, we'll cover the three primary characteristics of jazz as a distinct genre of music: sophisticated harmony, swing rhythm, and improvisation. We'll look at an 'A' section and a 'B' section, learning the chord changes and some rhythm variations; we'll also do play alongs for each section at different tempos. This tutorial is an introduction to Jazz style lead guitar. We'll cover the three primary characteristics of jazz as a distinct genre of music: sophisticated harmony, swing rhythm and improvisation. We'll learn how the essence of lead guitar in jazz style is "playing the changes". We'll learn how to build and play chord scales that follow the chords of a stereotypical jazz progression. We'll also learn how to build and play arpeggio lines that are based on the extended harmony chords typically found in a jazz tune. Christopher will show you a four chord turnaround, then add the bass line notes that connect the chords. Playing a bass note in between each chord fills in the time between each chord and creates the sound of motion "walking" from one chord to the next. In this series of lessons we're going to take a some of the elements of the style from the great Joe Pass, jazz guitar giant: how to orchestrate in his style by using jazz guitar drop 2 chord voicings and walking basslines. First I'll introduce the concepts to you, then show you how to play them. Then I'll show you how to use voice leading with these concepts, and finish off by putting everything together in a blues context. In this second series of lessons in the style of jazz legend Joe Pass, we'll expand on the first series and apply drop 2 voicings and walking basslines to three typical types of 7th chords. First we'll look at what we'll be learning in this set, then learn drop 2 voicings with major 7th chords, minor 7th chords, and dominant 7ths. Next we'll learn how to use all three chord types in a progression, and we'll conclude with putting everything together. Now we're going to move on to the third set of lessons in the style of Joe Pass, and learn to extend our drop 2 voicings and walking basslines across the fretboard. We'll start by examining the basic concepts here, then learn how to walk the G7 drop 2 voicing along the neck. Next we'll break down how to keep walking those chord voicings way up the entire fretboard, and we'll end by putting things in context and practicing the concepts. In this final set of lessons on the style of master Joe Pass, we're going to learn how to play jazz lead lines. As always, we'll start with an overview of the concepts, then we'll look at using chord tones to solo, then practice chord tones with a backing track. After that we'll use scale tones to solo, also followed by a practice lesson with a backing track. We'll then break down two Joe Pass style lead lines, and follow it up with combining them. Chord Melody style guitar playing is playing a solo arrangement of a tune by playing the melody, some supporting bass notes and, or chords all at the same time. In this tutorial I use the old jazz standard "After You've Gone" to demonstrate how to create a chord melody style arrangement. We will by breaking it down into a simple melody, and then building it back up into a full solo jazz guitar chord melody arrangement in the jazz guitar style of jazz guitar giant Joe Pass. In this set of lessons I'll be teaching you the great jazz standard "Our Love is Here to Stay", by George and Ira Gershwin. First I'll introduce the song to you, then give an overview. I'll start breaking down the song details with a look at the chord comping rhythm part followed by the rhythm performance. I'll then teach the single note melody and how to embellish it, and conclude with a melody and solo part performance. Chord Melody style guitar playing is playing a solo arrangement of a tune by playing the melody, some supporting bass notes and, or chords all at the same time. In this tutorial I use the old jazz standard "St. Louis Blues" to demonstrate how to create a chord melody style arrangement. We will by breaking it down into a simple melody, and then building it back up into a full solo jazz guitar chord melody arrangement in the jazz guitar style of jazz guitar giant Joe Pass. Christopher will show you how to play the chord progression, the melody, then the melody with chord tones, and finally a chord melody version. In this tutorial we will learn a more advanced version of 'Take Me Out To The Ball Game', the classic American tune about baseball in a jazz chord melody style. In this tutorial we will learn a George and Ira Gershwin song that has become a jazz standard, "They Can't Take That Away From Me". Christopher Schlegel will give you an overview of the song and talk about the tones to start; then examine how to comp the chords followed by comping the song itself. Then we'll look into the melody and soloing, followed by a "melody and soloing" play-along. Christopher finishes things off with a chord melody version. This tutorial will teach you how to play several basic two voice exercises. In each exercise, one voice will be scale played up then down; the other voice will be a repeated pedal note. Playing two voice in two different registers (bass & treble) is an important aspect of classical guitar style. Both the major & minor scales will be used. Both scales will be played in the bass register (lower, bass strings) & then in the treble register (upper, high strings). The pedal notes will be played on the opposite register as the scale. By the end of this tutorial, you should be able to play a simple classical guitar arrangement of Mozart's nursery rhyme "Twinkle, Twinkle Little Star". Beethoven's "Fur Elise" is one of his most widely recognized pieces. It's an exquisitely beautiful piece originally written for solo piano. In this tutorial series we will learn a simple arrangement of the main theme of the piece. In an earlier tutorial we learned to play the single note melody of the French folk tune "Au Claire De La Lune". This time we are going to take it a step further and learn more about notes as scale degrees, harmonize the melody, and add chord tones in order to create and play a simple classical guitar style arrangement of the tune. The we'll play it through in a full performance. In this set of six classical guitar lessons, I'll teach you the elements of Paganini's "Caprice 24" theme. In the first two lessons we'll look at how to harmonize and play a variation on the first section. Next we'll learn how to harmonize the second section of the piece, then play the second section through. In lesson 5 we'll play through the entire piece. I'll also add some performance advice at the end. This tutorial will show you how to play 'Waltz In E Minor' by Ferdinando Carulli. This is a beginner's classical guitar piece. The purpose of the piece is to get the classical guitar student focus on the often difficult process of learning to develop proper right hand technique. In this tutorial we will learn a simple arrangement of the main theme to "March Slav" by Tchaikovsky in classical guitar style. In this tutorial we will learn a simple arrangement of the main theme to the "Nutcracker March" by Tchaikovsky in classical guitar style. In this tutorial we will learn a simple arrangement of Johann Strauss' 'The Blue Danube' waltz theme in classical guitar style. In this tutorial we will learn a simple arrangement of one of the main themes in Anton Dvorak's 'New World' Symphony in classical guitar style. In this tutorial we will learn a simple arrangement of one of the main themes in Franz Joseph Haydn's 'Surprise' Symphony in classical guitar style. In this tutorial we'll learn a solo fingerstyle arrangement of "The Star Spangled Banner". We'll start with the basics, understanding the melody and how to add bass notes and chord tones. Then, we'll work through the entire arrangement note by note. After we get the notes in place, we'll learn how to add some performance flair by means of musical pauses called commas and fermatas. Finally, we'll add a dramatic ending flourish. This tutorial series of 10 lessons is the first 10 (Study 1 - Study 10) of Giuliani's 120 Right Hand Studies for Classical Guitar. Giuliani, a 19th century guitar virtuoso created these studies in an effort to systematize guitar playing skills for students. They are for developing right hand dexterity. This tutorial series of 10 lessons is the second group of 10 (Study 11 - Study 20) of Giuliani's 120 Right Hand Studies for Classical Guitar. Giuliani, a 19th century guitar virtuoso created these studies in an effort to systematize guitar playing skills for students. They are for developing right hand dexterity. In this tutorial we will learn to play a masterpiece of the classical guitar repertoire, the 'Bourree' from J.S. Bach's Lute Suite in E Minor. "Jesu, Joy of Man's Desiring" by Johann Sebastian Bach is a beautiful piece that's been arranged many times for solo classical guitar. In this tutorial we'll learn to play an intermediate level arrangement by the master of the Baroque era of music. In this tutorial we will learn a simple classical guitar arrangement of Frederic Chopin's 'Grand Waltz' Opus No. 18 piano piece. In this tutorial we will learn a classical guitar style arrangement of Pachelbel's 'Canon In D'. In this tutorial we will play a simple arrangement of the main theme to Tchaikovsky's 'Pathetique' Symphony in classical guitar style. In this tutorial we will play a simple arrangement of one of Tchaikovsky's themes from his 'Swan Lake' ballet music. In this tutorial we will learn to play an advanced technical exercise using typical right hand classical fingerpicking patterns and making use of the entire fretboard from open strings to 12th fret. Christopher will show you all the parts to this complete transcription of Bach's "Jesu, Joy of Man's Desiring". Baroque music consists of polyphonic counterpoint. This is a huge playing challenge for guitarists. Keeping two melodic lines moving at the same time requires the fretting hand to constantly change shapes and patterns. The picking hand will be required to do a fingerpicking technique in which the thumb plays the bass notes and the other fingers play either melody notes or chord tones. Christopher will show you all the parts to this complete transcription of Beethoven's "Adagio Cantabile", originally for solo piano. He'll cover the importance of making sure the melody and bass line are heard clearly, as well as the inner chord tones to flesh out the arrangement. Christopher will show you everything it takes to play a complete arrangement of this well-known and loved classical piano piece arranged for solo classical guitar. In this tutorial we will learn to play Francisco Tarrega's piece entitled 'Lagrima'. It is very much characteristic of Tarrega's work: Romantic, rich-sounding harmonies, wonderful melodic arc and quite beautiful. It is also a great piece to learn for the purpose of acquiring some very specific skills involving playing classical guitar. In this tutorial we will learn a beautiful Romantic classical solo piece by guitarist-composer Francisco Tarrega (1852-1909) entitled 'Adelita'. In this tutorial series we will learn a beautiful Romantic classical solo piece by guitarist-composer Francisco Tarrega (1852-1909) titled 'Endecha'. In this tutorial we will learn a Francisco Tarrega (1852-1909) piece for solo classical guitar 'Prelude No. 1 in D Minor'. In this tutorial we will learn a beautiful Romantic classical solo piece by guitarist-composer Francisco Tarrega (1852-1909) titled 'Recuerdos de la Alhambra'. In this tutorial we will learn an electrified arrangement of "The Star Spangled Banner". We'll start by working through melody, note by note, in E major. After we get the notes down, we'll focus on getting the best electric, overdrive tone for the tune. Finally, we'll add some performance flair by means trills and bending. Let's get started! This introduction to the musical term legato will show you what it is, what it means, how it sounds and how to play in a legato manner. It is contrasted with staccato and characterized as a technique used in musical phrasing or articulation. Christopher will show you the fundamentals of muting technique. We'll discuss both fretting hand and picking or strumming hand. We'll also approach the topic from multiple skill levels: beginner, intermediate and advanced. If you combine a hammer-on and a pull-off you've got the beginning of a trill. A trill is a musical ornamentation technique hat consists of rapidly alternating between two notes. In this tutorial you'll learn some exercises that can help building your trilling technique. We'll systematically work each finger into the routine. Christopher will show you how to get a variety of tones and tricks from the most under appreciated tone tools at the guitarists disposal: the volume knob! You'll learn how to get a variety of tones from adjusting the volume knob on your guitar for lead and rhythm playing applications. In this short tutorial on tips and tricks, Christopher Schlegel is guest host for the GT channel and examines diatonic notes, first inversion chords, and how to play melodic phrases.